When you take the right approach, pinching pennies can be more fun than you’d expect. You may already have your own money saving tactics, but these five can help you have a good time while keeping your purse strings tight. There’s no such thing as free money… or is there? Credit card companies get rich off interest payments and late fees, which enables them to offer excellent perks to people who can control their spending. If you can use multiple credit cards without living beyond your means, it’s possible to save money in all sorts of ways. If you fly frequently enough, you should be earning miles and cutting back on your travel expenses. If you’re an Amazon addict and purchase every household item online, get an Amazon card and make those purchases count. Since this type of saving starts with spending, I have to provide a disclaimer: do not try to rack up points if you’re already buried under a mountain of debt. You lose money to interest charges faster than you make it back with points, so don’t get excited about credit card earnings until you’re living a debt-free life. While I have not enjoyed this personally, I’ve talked to a lot of people who are living very well and doing it rent free. Naturally, your lifestyle has to support regular uprooting and working remotely. If you have those pieces in place, or you can afford to be without a job for a stretch, you can save a tremendous amount of money that would otherwise be going to your rent/mortgage and utilities. On top of that, you get the awesome experiences that come with traveling. Housing is the biggest expense for most people. If you’re living paycheck to paycheck and most of your money is going into an overpriced rental, check out Trusted Housesitters and consider joining the house-less movement. Even if you quickly find out it’s not for you, you can still save a month’s worth of rent and gain some cultural experience! I definitely don’t mean this literally, as being a farmer is exceptionally hard work. However, with the rising popularity of urban farming and the accessibility of quality supplies, you can grow a decent amount of food in your own home. While you can’t live off of the tomatoes and cucumbers grown in your backyard, you can supplement your meals pretty well, and it’ll only cost you a few dollars to get started. If you really want to invest in your gardening hobby, you can eventually grow more and save more. It’s easy to scoff at the idea of growing your own food because produce can be relatively cheap at the grocery store. I challenge you to look over a season’s worth of grocery spending and think about how much you could cut back if you weren’t buying certain vegetables and herbs. The total savings might be more than you’d expect. If tilling soil and planting seeds isn’t your style, there are other things you can do around the house to reduce your spending. People tend to pay a lot of money for non-necessities when those same items can be obtained for free with a little bit of creativity. Instead of replacing a piece of furniture, think about refurbishing. Take the drawers from an old dresser and turn them into a shelving unit. If you can move past the desire to have a $500 entertainment center, you can probably meet that need with a $50 entertainment center that just needs a little TLC. You’re not going to add thousands of dollars to your bank account by turning old encyclopedias into end tables (it can be done!). However, when you’re able to work with your hands, save money and create something useful, you’ll probably feel pretty good about the end product. I’m not saying you should work constantly, because that’s no way to live. Instead, I’m encouraging you to look into productive hobbies – ways you can spend your off days that are fun, free and fulfilling. 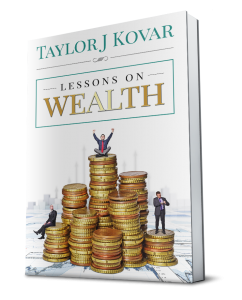 I started writing a book, Lessons on Wealth, because friends and family put some pressure on me to do so. As reluctant as I was at first, I eventually found the process was rewarding, enjoyable, and it didn’t cost me a dime. If you start writing, reading, painting or playing the guitar in your down time, you’ll spend less time and money at movie theaters and coffee shops. The next time you’re looking for something to do on a Saturday afternoon, try going with a free activity instead of some form of paid entertainment. For these savings tips to actually be fun, you have to really commit to them. It will probably be hard at first, but a little change in lifestyle and a positive attitude can go a long way. If you stick with it, you can save a lot while sacrificing very little.